Levels of mistrust particularly increased after 2010 when several European countries adopted a series of structural reforms in order to deal with market confidence and in- stability in the Eurozone. In addition, countries in which citizens suffered the most from the austerity measures such as spending cuts and tax rises displayed some of the lowest levels of trust towards EU policy-making institutions. However, the significant increase in the parliamentary representation of eurosceptic parties throughout Europe in the 2014 elections shows that increasing mistrust is a widespread phenomenon that does not belong to some countries exclusively. 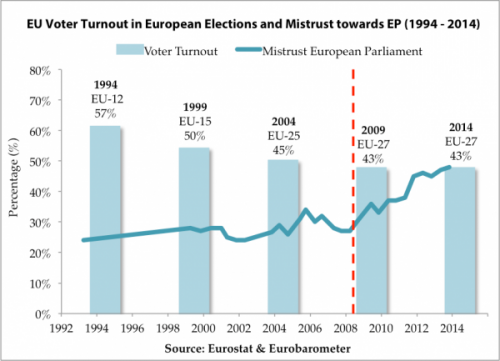 There are two possible explanations for the rise of political mistrust in EU member states. The first one is economic and would argue that voters punish their representatives indiscriminately for the rise of unemployment rates. This behaviour would be in line with theories of economic voting that argue that citizens use the ballot box to punish those responsible for economic downturns. The second explanation is political and would explain rising levels of mistrust for the inability of politicians to react adequately to the economic challenge. This sort of argument would connect with research that point at the difficulty of citizens in identifying who is truly responsible for political outcomes in multi-level polities like the EU. Allocating responsibility for the crisis is complicated by the fact that it is not entirely clear who is to blame for the Great Recession. The management and response of the economic crisis has not been left to national politicians exclusively, who have often alleged a lack of feasible alternatives to the painful reforms thus shifting blame towards EU and international institutions. The EU and the ECB as well as international institutions such as the IMF have had their say in how states should manage their national economies, though it is unclear to what extent they are to be held responsible for the reforms as they are limited to giving recommendations and the ultimate competence of implementing such policies was of national institutions. According to the latest Eurobarometer results, however, 63 per cent of citizens in the EU-28 believe that the EU is to blame for austerity. In this situation, even informed voters find it difficult to clearly allocate responsibility and use the existing mechanisms of accountability effectively. At the same time, the traditional mechanisms of reward and punishment do not work adequately as EU citizens cannot vote out of office those in positions of responsibility in the ECC or the IMF. The lack of clarity of responsibility and the inability to throw the rascals out may explain why levels of political mistrust have rapidly accelerated in the past few years. In addition to the structural deficiencies of the EU and its perception as part of the problem, citizens also remain sceptical about its potential role in contributing to the solution. According to Eurobarometer data, a majority of the population still thinks that the EU is not creating conditions for more jobs in Europe (52%), that it generates too much red tape (74%), that it does not make the financial sector pay its fair share (45%) and that the EU is not making the quality of life better in the continent (49%). Although the gap between citizens and EU institutions has clearly widened in the past years, the Great Recession can only be accused of exacerbating a problem that already existed since the creation of the Union. The EU has not managed to strengthen a European Demos despite the qualitative progress agreed upon the different treaties between member states. In short, the economic crisis has highlighted inherent structural deficiencies while further alienating the European citizenry from the European institutions. Whereas the first gap referred to the distance between citizens and politicians, the second one refers to the growing divide between North and South, centre and periphery or, as they are increasingly known, between ‘creditor’ and ‘debtor’ countries. The uneven impact of the crisis in detriment of the so-called debtor countries has accentuated the process of economic divergence producing two clearly distinguishable clusters of countries with distinct and even opposing interests. A growing political, economic and ideological divorce poses a threat to the aspiration of the EU for an ever-closer union. Although one of the main priorities of the EU has been that of fostering political integration, significant disparities amongst member states have long shaped the debate on the future proceedings of the union. The much-debated concept of a two-speed Europe in policy circles, that is, the idea of different levels integration to the EU depending on the political and economic situation of each country, reflects the existence of divergence between members long before the outbreak of the economic crisis. Several terms have been coined to mark these differences – amongst the most notable, the pejorative acronym PIIGS (Portugal, Ireland, Italy, Greece and Spain), which described a group of financially weak countries located in the periphery of the Eurozone. A more accurate cleavage would be the debtor-creditor divide, which captures the net international investment position (NIIP) of countries and classifies them according to whether they are debtors –with a negative NIIP, or creditors –with a positive NIIP. The Great Recession appears to have significantly exacerbated the disparities between these two blocks. 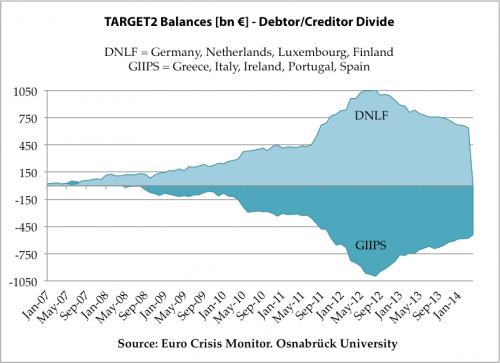 The Target2 balances, illustrated in Figure 2, are often used to explain the Eurozone crisis. In simple terms, this indicator measures each country’s credit surplus or deficit with regards to other countries in the Eurosystem, that is, whether they are creditor or debtor countries. During the period between 2007 and 2014, one of the key political con- sequences of the recession was the creation of two sets of European countries. On the one hand, there were countries that managed to maintain a credit surplus such as Germany, the Netherlands, Luxemburg or Finland; on the other hand, there were those who saw its balances go into a credit deficit such as Greece, Italy, Ireland, Portugal and Spain. It needs to be point out that, in terms of location, not all creditor countries were ‘Northern’ and not all debtor countries were ‘Southern’. Geography could not explain the creditor-debtor divide, neither for the EU 12 nor for the EU 28. And why is such a distinction between countries relevant? Though the effects of the economic crisis have also left its mark in the so-called creditor countries, the consequences have been noticeably less severe. Macroeconomic indicators of creditor countries reflect the effects of a mild bump in the economic cycle, if at all, rather than a large-scale 1929-like recession. On the contrary, the loss of confidence in the solvency of debtor countries led to high levels of sovereign debt that resulted in several bailout packages (Greece and Ireland in 2010, Portugal in 2011 and Cyprus in 2012). The constrained spending capacity of these countries together with the col- lapse of credit flows resulted in social loss unemployment levels. More so, inequality and poverty rates have rapidly risen as the states financial leeway to sustain welfare programs narrowed substantially for the most indebted countries. The political and economic cleavage that characterized the EU since its conception has deepened with the Great Recession. Not surprisingly, creditor countries have been able to palliate the effects of the economic crisis far better than debtor countries thanks to their solid economic foundations, credibility, lack of financial and housing bubbles and, generally speaking, good performance of the key macroeconomic indicators. As such, the opinions of citizens of the two clusters towards different views of EU policy are substantially different. For instance, although the support for further integration in the EU has lowered in average for all countries, the difference is significant when looking at the Southern European states. Likewise, support for free market has increased in EU in average but decreased for the Southern European countries whereas the opposite has happened with support towards social policies. These conflicting sets of preferences are an indicator of the furthering breach between two clusters of countries within the EU. The third and final gap represents the widening breach between EU citizens themselves. The Great Recession has worsened the living conditions of entire populations and measures of poverty and social exclusion have drastically increased in some countries. Income inequality has also expanded for some of the most affected countries. Hence, the third and final gap does not oppose institutions or countries but citizens themselves. As it can be seen in Figure 3, data on income inequality is extremely varied. The evolution of the Gini index, a coefficient that measures the degree of inequality for a country’s residents, has particularly deteriorated for some key countries, reflecting the widening gap between the rich and poor. However, the expectation that ‘debtor’ countries most affected by the crisis would see a great increase in income inequality is not graphically confirmed. There can be no doubt that the crisis has impoverished the EU as a whole but it is not possible to come up with a simple and parsimonious explanation for the 28 member states. 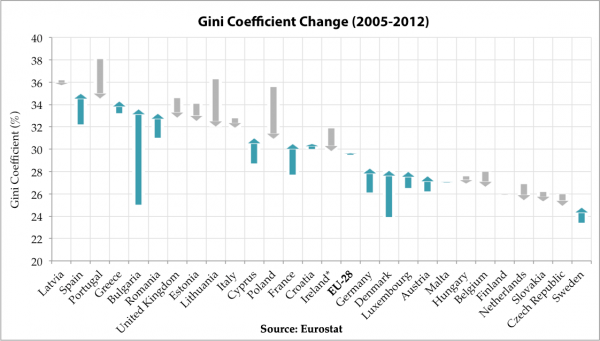 For example, whereas living conditions of Spanish and Greek citizens have greatly deteriorated and this negative evolution is also reflected by an increase in the Gini coefficient, in other debtor countries such as Portugal and Italy the levels have remained relatively stable if not decreased. These results are somewhat misleading as they capture the income differences after the application of domestic inequality-reducing polices and are not necessarily a reflection of the first-order effects of the economic crisis. Despite the variation between member states, the total average income inequality for the EU-28 has only increased moderately (0.2%). These substantial variations amongst countries, as well as the fact that all debtor countries have not been affected in a similar manner, suggests that redistributive national polices play an important role in reducing income inequality even in the context of a Great Recession. However, the absolute levels of the Gini coefficient do reflect a significant difference amongst the debtor and creditor countries, where overall, those countries that have been most vulnerable to the economic crisis display larger levels of in- come inequality and thus differences amongst citizens. Research on poverty and social exclusion has also found that the economic crisis has reversed the previous converging trend on poverty and social exclusion amongst member states. Citizens in poorer countries have been more vulnerable to the effects of the crisis and median incomes have decreased substantially while the risk of anchored poverty has clearly increased, especially for Greece and Spain. The results of the poverty reduction in Europe research project (ImPRovE) suggest that “the crisis and ensuing austerity policies have resulted in a serious decline in incomes in many of the countries hardest hit by the downturn”. While redistributive policies might have to some extent palliated the effects, the living standards have declined for the lower income sections of the population, especially for young people and families with children. As expected, the effects have been a lot less severe for the so-called creditor countries. The unequal effects of the Great Recession have also translated into unequal consequences for different citizen groups. The rising numbers of protests against austerity and for economic justice have substantially increased both worldwide and in high–income countries since 2008. In Europe, some of the countries most affected by the so-called ‘austericide’ such as Greece, Portugal, Ireland and Spain have also provoked as set of mobilizations led by civil society organizations. The economic crisis that started in September 2008 has widened three gaps between: (1) citizens and institutions; (2) debtor and creditor countries; and (3) citizens themselves. As a matter of fact, the Great Recession has inflicted serious damage to the European project while aggravating already existing gaps that pose a threat to the consolidation of the EU as a union of citizens rather than a confrontation of state interests. These three widening gaps are problems in themselves but, more importantly, they point to a divergence of interests within the EU. Different political actors, from individuals to supra-national institutions, have developed distinct sets of preferences in recent years depending on their geographical location, level of wealth, etc. States and societies have always had different interests, might say the critic, but the EU has been instrumental in fostering convergence since the post-war period and now remains powerless to slowdown this growing divergence. The polarization of interests creates an additional obstacle in coming up with widespread agreements and policies. At its more basic level, the EU Member States and the societies that populate them find it difficult to agree on a common diagnostic (as well as a treatment) for the political consequences of the crisis. Unless the European citizenry agrees on the nature of the problem at hand it will become impossible to come up with a solution to fix the alleged problem. Finally, it is far from clear that the EU has acknowledged these growing gaps or discrepancies. The EU’s motto of ‘unity in diversity’ risks becoming an empty shell and a set of words that no longer encapsulates the beliefs and ideals of a Europe that is growing farther apart. It is important that these gaps are not only seen as the consequences of the Great Recession but also as inconvenient obstacles to the formulation of supranational policies to the economic crisis. Only when these gaps are tackled will European actors find it possible to find a common ground to define coherent EU policies that fix the problems of real people. Although the gap between citizens and EU institutions has clearly widened in the past years, the Great Recession can only be accused of exacerbating a problem that already existed since the creation of the Union. In the 2014 elections turnout remained at 43%, showing that the economic crisis did not drive more Europeans to the ballot boxes. The much-debated concept of a two-speed Europe in policy circles reflects the existence of divergence between members long before the outbreak of the economic crisis. The economic crisis has reversed the previous converging trend on poverty and social exclusion amongst member states. While redistributive policies might have to some extent palliated the effects, the unequal effects of the Great Recession have also translated into unequal consequences for different citizen groups. The EU Member States and their societies find it difficult to agree on a common diagnostic (as well as a treatment) for the political consequences of the crisis. Unless the European citizenry agrees on the nature of the problem at hand it will become impossible to come up with a solution to fix the alleged problem. This piece originally appeared on the Cidob website. Diego Muro is Assistant Professor in Comparative Politics at the Institut Barcelona d’Estudis Internacionals (IBEI). Prior to joining IBEI he was Associate Professor in European Studies at King’s College London and Senior Fellow at St Antony’s College, University of Oxford. His research interests include comparative politics, ethnic conflict and asymmetric warfare. Guillem Vidal holds a BSc in Economics from the Utrecht School of Economics (USE) and a MA in International Relations from the Barcelona Institute of International Studies (IBEI), were he currently works as a research assistant. His research interests include political economy, comparative politics and Southern Europe. This entry was posted in Euro, Europe, European elections, Euroscepticism and tagged Accountability, democratic deficit, ECB, Gini, Gini coefficient, Inequality, legitimacy. Bookmark the permalink.